Phoenix Wright: Ace Attorney is eighteen years old, but its new big-screen re-release for PC, Switch, PlayStation 4 and Xbox One makes one thing clear – it’s an absolutely timeless classic of the adventure visual novel genre. The journey here hasn’t been all smooth sailing. The original game’s GBA release wasn’t deemed worthy of a Western release, but a touchscreen-focused Nintendo DS reissue in 2005 saw it localized and become a huge success. Since then Phoenix has starred in a full trilogy, shared the limelight in a second, crossed over with Professor Layton and the worlds of Marvel, been adapted into manga, live action film and anime and generally become a proper Capcom All-Star. Wright is up there with Redfield, Masters, West, X and all those heroes, and rightly so. The Ace Attorney games have also been liberally re-released, though not always with the best results: a mobile-based HD trilogy featured stilted animation and a generally lackluster presentation. Indeed, that iOS and Android based version of the first three titles in the series is what meant I approached this new re-release of the games with great trepidation. It’s really hard to take a gorgeous, blocky sprite-based game and replace the artwork with smooth-edged, HD-friendly stuff. On paper the hand-drawn art should be better, but inevitably charm is lost. In the previous HD versions of the Ace Attorney trilogy the problem was mostly around animation; frames were lost in the conversion process, leading to a generally poor-quality look. I feared this new version would simply be that one ported to new hardware, retaining the same problems. Here’s the great news: it isn’t. While the entirely subjective debate about scanned art versus sprites will rage on forever, one can at least confidently say that this is an objectively on-par game with the GBA and DS originals, retaining all of the frames of animation and intricate details from the sprite versions in a more high definition friendly format. The presentation is generally better too, from text boxes to menu elements – a strong font with good kerning will take you a long way indeed in a game like this. It’s also very likely some enterprising fan will drop the sprite art into the PC version as a mod in rather short order. Things seen as unbroken aren’t fixed – so the music is still hummable chippy GBA-style stuff, and slight intricacies in the incredibly charming translation (is this series set in Japan or America? The localized version of the series can’t seem to decide, and has even self-awarely made that fact into a running joke) are left be. Why not? There’s a good suite of quality-of-life features added, too. There’s a two-fold text skip option, where a tap of a button will skip to the end of a line, while holding the same button down will fast forward all dialogue. There’s no voice-over here, and sometimes the puzzling elements of the game will see you revisit the same dialogue a few times searching for hints – so these are welcome features. There are options atop options – so as well as the ability to skip, you can even customize the fast-forward speed. If the default opaque text boxes obscure too much art for you, you can sacrifice a little text legibility with a text box transparency setting. It feels as though this release has been very carefully and thoughtfully constructed. There’s even an allowance for touchscreen controls on PC if you’ve a touchscreen laptop or monitor. I’d expect this feature for handheld play on the Switch, where it’s also present, but on PC it’s the sort of thing companies are often disinclined to bother with. I know Capcom has been on a roll with stuff like Monster Hunter and Resident Evil, but they’ve never been too great about re-releases and their back catalog, so I’m impressed. The fact that this is at last another decent release of the original Ace Attorney Trilogy is particularly welcome because as previously mentioned these are three of the finest visual novels ever made – particularly the first and third entries in the series. The ebb and flow of Wright and Maya’s adventures is just something that works in a sort of effortlessly genius way. Investigations are slow-paced adventure game action, all trawling crime scenes, chatting to witnesses and clicking on things in search of clues or more fun, irreverent dialogue. Once you hit trial, everything changes. 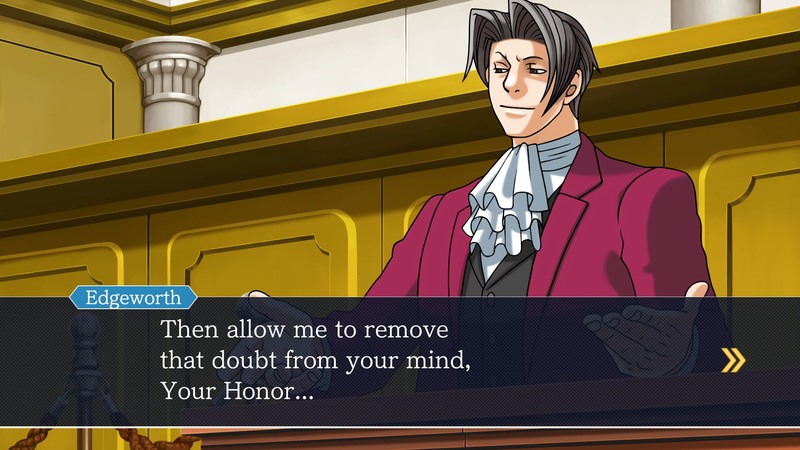 The world Wright inhabits is still exaggerated and silly, but in trial the consequences are serious: this is an adventure game that has game-over states, dead ends (with checkpoints to go back, of course) and tense verbal shoot-outs in the courtroom. There are few feelings in gaming like the one you get when you finally begin to turn things around, not only proving your client’s innocence but turning suspicion on a new suspect. They panic and protest, you tasked with cornering them with your gathered evidence. The music ramps up and it feels great and unlike anything else in the genre. Others like Danganronpa have had success in replicating parts of this formula, but nowhere is it more potent than in Ace Attorney. Better still is that this is now a solid version of the full first trilogy that runs as it should on modern hardware. Each case is a stand-alone affair, but there’s also a deeper, interlinked narrative thread through these three titles that culminates brilliantly in the final stretch of the third game. There’s also the natural ramping up of a sequel here, with each title introducing a few more mechanics and complexities than the last. These factors make having all these games in one package on modern machines – and now in perpetuity on PC – all the more valuable. Speaking of value, this release is solid there too – you’re talking around fifteen hours a game at least. Phoenix Wright: Ace Attorney Trilogy is out now for PC, Nintendo Switch, PlayStation 4 and Xbox One. PC and Switch versions tested; Switch review copy provided by the publisher. Also: now this is on Switch can we get Phoenix in Smash Bros. please? Cheers.